As your web-based operations become increasingly mission-critical, a server failure can massively disrupt your business — losing customers, impacting employee productivity, and negatively impacting the bottom line. Traditional monitoring and failover solutions that require deploying and supporting expensive hardware and software are cost prohibitive for many enterprises, particularly as the number of mission-critical servers grows exponentially. 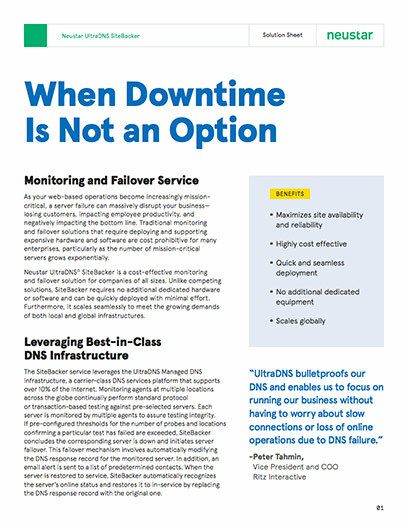 Neustar UltraDNS® SiteBacker is a cost-effective monitoring and failover solution for companies of all sizes. Unlike competing solutions, SiteBacker requires no additional dedicated hardware or software and can be quickly deployed with minimal effort. Furthermore, it scales seamlessly to meet the growing demands of both local and global infrastructures. The SiteBacker service leverages the UltraDNS Managed DNS infrastructure, a carrier-class DNS services platform that supports over 10% of the Internet. Monitoring agents at multiple locations across the globe continually perform standard protocol or transaction-based testing against pre-selected servers. Each server is monitored by multiple agents to assure testing integrity. If pre-configured thresholds for the number of probes and locations confirming a particular test has failed are exceeded, SiteBacker concludes the corresponding server is down and initiates server failover. This failover mechanism involves automatically modifying the DNS response record for the monitored server. In addition, an email alert is sent to a list of predetermined contacts. When the server is restored to service, SiteBacker automatically recognizes the server’s online status and restores it to in-service by replacing the DNS response record with the original one. Through the UltraDNS management portal, administrators select specific host records for monitoring. SiteBacker can be configured with pools of addresses to be used as failover records for the primary record that is monitored. Each record, or pool of records, can be assigned a priority value. The failover records are served in order of highest priority. Administrators can also create sub-pools within pools. The management portal allows administrators to quickly make changes to the monitoring and failover schema, such as adding and removing devices, altering monitoring parameters, and modifying pool configurations. UltraDNS’s advanced replication technology assures these changes are propagated globally in near real-time. You have total control over the service—no email requests or trouble tickets required. In the event of a potential outage or server downtime, the Neustar UltraDNS® Sitebacker monitoring and probing agents will send an automated alert notifying customers of the issue at hand. Sitebacker will then automatically redirect traffic to the designated disaster recovery server(s) on standby. When the issue is resolved, traffic will redirect back to the primary server.